Donald Trump in Cedar Rapids. Republican presidential candidate Donald Trump is warning that the federal budget deal that cleared the Republican-led congress this week may send the country into recession. 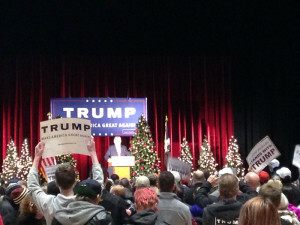 Trump spoke to a crowd of about 1200 in Cedar Rapids. The audience laughed as Trump ridiculed Republicans who voted for the budget deal. “‘Do you vote for this horrible budget that’s going to put us further in debt? '” Trump asked from the stage, suggesting Republicans in congress would respond: “I do. I swear I do.” Trump concluded with this promise: “That will never happen with Trump,” and the crowd cheered. Trump blasted federal monetary policy and the estimated $21 trillion federal debt. Trump, who was on stage for an hour and 15 minutes, was joined by his son, Don, and some of his grandchildren. Trump talked briefly about some of his rivals for the Republican presidential nomination, assigning the label “good guy Ted” to Texas Senator Ted Cruz, but suggesting Cruz, Florida Senator Marco Rubio and “others” are late to join his call for a wall along the southern U.S. border. Trump’s harshest words, however, were for former Florida Governor Jeb Bush. Trump called Bush “close to incompetent” for the way Bush has waged his campaign. Bush is campaigning in New Hampshire today and he, in turn, questioned Trump’s foreign policy assessments and Trump’s affinity for Russian President Vladimir Putin. Gunther Frank of Cedar Rapids is “definitely” attending the Caucuses and has narrowed his choice down to two candidates. One of them is Trump. About 50 protesters gathered across the street from the auditorium where Trump spoke. Erica Zito of Cedar Rapids used the word “xenophobic” to describe Trump’s call to temporarily block Muslims from entering the country. Hassan Selim, the Imam at the Islamic Center of Cedar Rapids, was there with a sign.